My name is Emma (unless you are one of my pupils, then it’s Miss Rickard to you) and I am currently undergoing a Postgraduate Certificate in Education (PGCE) in English. Firstly, I’ll answer an increasingly common question: no, I’m not brave and I’m certainly not mad to go into teaching. For me, teaching is the most rewarding career I can pursue due to my love of working with young people and my own passion for learning. 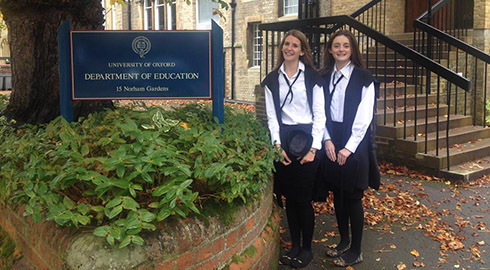 I’ve chosen to do my PGCE course at the world-renowned University of Oxford as they pioneered and still follow an internship scheme model. This approach allows interns (known as student teachers) to spend a large amount of time in their first placement school rather than skimming the surfaces of two separate schools for the same period. I’m really looking forward to being a valued member of teaching staff whilst training in school and studying at such a famous institution with the leading researchers and practitioners in the education field. Every time I cycle past the Radcliffe Camera and other beautiful, historic landmarks, I count my lucky stars that I was accepted onto the Oxford course – even if that cycle is in the pouring rain at 7am! Six weeks in and I’m thoroughly enjoying myself despite the mounting workload. Today I taught my first full class; year nines re-enacting Willy Russell’s Blood Brothers with some interesting dramatic interpretations, I must say. It’s truly terrifying – yet slightly relieving – to think that it is already half term next week! Time is just racing away from me and before I know it, it will be June and the turbulent journey that is initial teaching training will all be over. What I’m hoping to gain from the course is, first and foremost, qualified teacher status (QTS) to enable me to apply for my first post as a newly qualified teacher or NQT (education is full of acronyms). On a more idealistic note, I hope that this course allows me to become a well-rounded, self-analytical teacher that can inspire and motivate students to foster a passion for English language and literature. As the days are ticking over at an alarming rate, I’m soon going to have to face reality and apply for my first teaching post. Ideally I would like to teach in a British mixed state school but any details more specific than that currently evade me. Once I am more experienced, I would love to return to my roots and apply for a teaching post in East Asia, particularly in Singapore where my own educational journey began. From past and present volunteering and placements I’ve discovered an interest in Special Educational Needs provision and social equality in schools. Consequently, I would love to work with children to overcome adversary in education. Under all of those lofty plans of successfully moving my way up the teaching career ladder and across the globe away from the city of dreaming spires, there is one ambition that will remain constant despite where I end up or who I am teaching, and that is to be the best teacher that I can be. Painfully clichéd I know, but we all need a little motivation now and again!